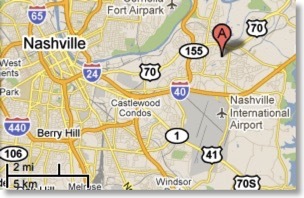 Age: 10-19 | Laser Pointer Safety - News of aviation-related incidents, arrests, etc. An unnamed 17-year-old boy was arrested November 9 2017 in western Sydney, for aiming a laser pen at a New South Wales Police helicopter. The aircraft was on patrol when the incident occurred. The teen was found hiding in a backyard. He will be subject to the Young Offenders Act. A 15-year-old boy from Bradenton Florida was arrested for aiming a green laser beam multiple times at a Manatee County Sheriff’s Office helicopter on December 12 2017. The helicopter crew directed ground officers to a home in Bradenton, where the teen was arrested. According to a sheriff’s office spokesperson, the boy was not able to explain why he pointed the laser at the helicopter. The unnamed youth was taken to the Juvenile Booking Facility. On December 26 2017, the Oklahoma City Police Department helicopter was illuminated by a green laser beam, three times. The crew directed ground officers to a home where 19-year-old Iban Balderas was arrested. He was charged with violating Oklahoma’s Laser Safety Act. Trial of a Cayman man, charged with multiple counts of aiming a red laser beam at a police helicopter, began September 13 2017. The incident took place on April 29 2015. Officers on the ground had seen a red laser beam that appeared to be attached to a firearm. The helicopter was sent to investigate. A detective in the helicopter testified that he saw a bright red light which was pointed at the aircraft numerous times. The detective said he was worried for the pilot’s vision, and also that the laser could be attached to a weapon. He radioed a description of the suspect to ground officers. Based on his appearance, officers approached Javonnie Silburn, then approximately 19 years old. They asked if he had a laser; Silburn said yes and showed them a device that had both an LED light and a red laser beam. He was arrested on a charge of endangering an aircraft. Later Silburn told police that he did not do it, that it was another man. Prior to the trial, Silburn attempted to plead guilty to shining the laser at the helicopter one time. But the Crown did not accept the plea due to the multiple times the laser was directed at the aircraft. The endangerment charge was apparently dropped. Silburn, now 21, is being tried on a charge of using threatening, abusive or insulting words or behavior within the sight or hearing of a person likely to be caused harassment, alarm or distress. Under cross-examination on the first day of the trial, the detective admitted he could not say definitely that Silburn was the person with the laser, only that he identified a man with an Afro hairstyle and short pants. According to the Cayman Compass, there was a separate laser incident in November 2015 involving police aircraft. From stories in the Cayman Compass by Carol Winker. (August 31 2017 story about trial being set, Sept. 13 2017 story about initial court proceedings, Sept. 14 2017 story about trial being delayed for a few days). UPDATED September 28 2017 - The trial was delayed until October 11 2017. Around 1 am on August 9 2017, a Charlotte-Mecklenburg (NC) Police Department helicopter was targeted by a green laser pointer. The crew spotted a person standing outside a vehicle, holding a laser. 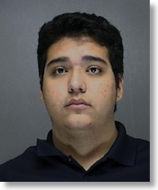 They notified ground officers who located the vehicle, found a laser inside, and arrested 18-year-old Abrahan Saloman Nass Romero, aka Abrahan Nasser. The officers also found marijuana in the vehicle. Romero was charged with pointing a laser at an aircraft — a felony — and with possession of marijuana up to one-half ounce. Records show Romero had previously been arrested for marijuana possession, for speeding, and for driving without a license. Since January 2017 there have been 19 incidents reported to the Federal Aviation Administration of lasers being pointed at aircraft in the Charlotte area. A 19-year-old Oklahoma City teen was arrested June 19 2017 for aiming a green laser beam multiple times at an Oklahoma City Police Department helicopter. The aircraft was on patrol when it was illuminated around 10:30 pm. 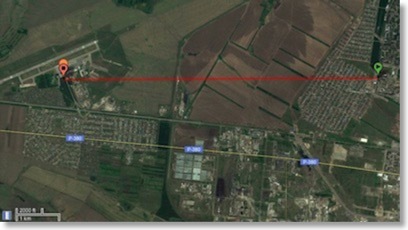 The beam was traced to a house. Ground officers arrested Darren Williams. He was charged on both state and federal counts. On the federal charge, he could face up to five years in prison, and a fine of up to $250,000. Enrique Felix Gomez pleaded no contest September 14 2015 to aiming a high-powered green laser at an aircraft, and then at Los Angeles County fire and police helicopters on February 14 2015. Gomez, of Gardenia Calif., was sentenced November 2 2015 to one year in jail and three years probation. A south London teenager was arrested on July 27 2015 for aiming a laser pen at a Metropolitan Police helicopter. The aircraft was searching for a burglar when it was repeatedly hit. The crew identified the source, and the boy was arrested about an hour later. He was charged with endangering an aircraft. A 19-year-old Woollamia man will appear in Nowra (NSW) Local Court after being charged with shining a laser pointer at a navy helicopter from HMAS Albatross on October 30 2014. It is alleged the man targeted a Seahawk helicopter from 816 Squadron as it was returning to HMAS Albatross after a training flight about 10.30pm. The high-powered laser was pointed at the aircraft for around a minute from the car park of the man’s workplace at South Nowra. The helicopter landed safely, with the four crew members on board treated for slight eye pain. Police from the Shoalhaven Local Area Command interviewed the pilot and co-pilot, who provided an approximate location of the beam’s origin. Police searched the area and located the 19-year-old man. 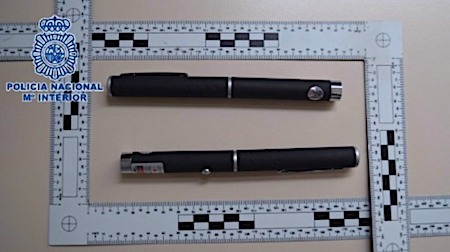 A laser pointer was seized by police and the man was issued with a future court attendance notice and is due to appear in Nowra Local Court on November 19. 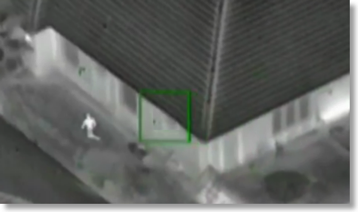 A 12-year-old boy aimed a green laser beam at a Maryland State Police helicopter on October 12 2014. The aircraft was returning from a medivac mission when it was illuminated four times by the beam, near Mount Airy MD. Ground police who were directed by the helicopter to the laser’s source. The boy was given a warning. 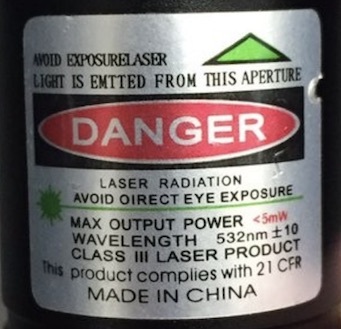 Police described the laser as an “astronomy” laser used to locate objects in the sky. 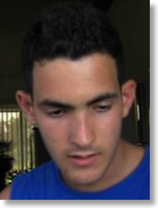 Brothers Abrahim Rashid Khan, 20, and Shaun Ahmed Khan, 18, pleaded not guilty on September 8 2014 in Riverside (Ca.) County Superior Court to one misdemeanor charge each of maliciously pointing a laser at an aircraft. The incident occurred July 14 2014, when a sheriff’s helicopter was struck “numerous times” by a laser beam. Ground officers were directed to the source of the beam, where the two brothers were arrested without incident. A trial conference was set for November 12 2014. 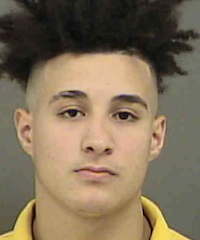 Smith Hayden Brundage, 19, of Mecklenburg, North Carolina, was charged with two counts of use of a laser device towards an aircraft, after he aimed a green laser pointer at a Charlotte-Meckenburg Police Department helicopter on August 12 2014. 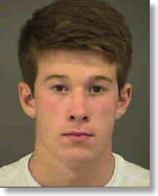 According to Brundage’s lawyer, the teen wanted to see if the laser light could reach the CMPD helicopter. It did; Brundage told his parents and they called police. His lawyer says the youth is a “really good kid who made a really dumb decision” and is “ready to face up to” prosecution. The FBI joined the local police department in investigating the incident. The federal agency has not decided whether to file federal charges. According to the FAA, there were 34 laser shining incidents to date in 2014, in North Carolina; nine of these occurred in the Charlotte area. A teenager aimed a green laser beam from a moving vehicle, towards a San Bernardino County Sheriff’s patrol helicopter on February 27 2014. She was arrested and could face up to five years in jail and a $250,000 fine. Jenny Gutierrez, 19, was captured after the pilot followed Gutierrez to her home, and reported the location to sheriff’s deputies. A 17-year-old from Strood, near Kent, was arrested December 21 2013 on suspicion of endangering the safety of an aircraft. A police helicopter was looking into a burglary when it was struck by a laser beam at about 11:30 pm. The teen was located on Rochester High Street and was arrested. He is out on bail until January 17 2014. 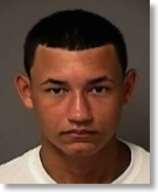 A Florida teenager did not realize the hazard, when he used a green laser pointer to track a Volusia County sheriff’s helicopter less than an hour into the new year on January 1 2014. Police said that 18-year-old Andrew Decker hit the Air One helicopter at least four times. 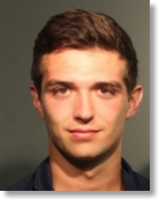 Ground officers arrested Decker, a college student, with the laser still in his hand. In a statement emailed to the Daytona Beach News-Journal, Decker said he was sorry and did not realize that what he was doing was dangerous. He said a neighbor tried to warn him it was a crime but he did not hear the man due to New Year’s celebratory firecrackers going off in his neighborhood of Holly Hill, a few miles north of Daytona Beach. On October 23 2013, a Texas Department of Public Safety helicopter saw a laser beam targeting the aircraft as it flew near Odessa. Officers on the ground did not find him, so the next night, the helicopter flew over the same area at the same time. A laser was again pointed at them. Officers on the ground found a teenage suspect who admitted pointing the laser at the helicopter. 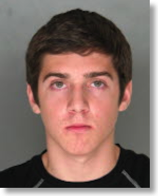 They arrested Joey Martin, 19, and charged him with illumination of aircraft by intense light. 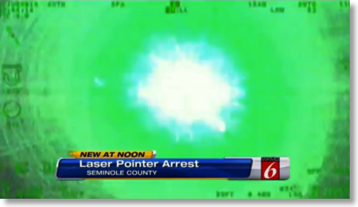 Commentary from LaserPointerSafety.com: This is the second story in October 2013 where law enforcement flew special helicopter missions to draw out a laser perpetrator. The other case involved a complex, multi-agency supervision of a suspect in Portland, Oregon. This could be a coincidence -- such missions probably have been flown in the past. But it may also indicate that law enforcement is becoming more proactive and determined to locate and arrest perpetrators. Four men were arrested for aiming a laser beam from a moving car, at a police helicopter in Melbourne on October 5 2013. A 20-year-old man from Preston was charged with interfering with conduct endangering life and possessing a prohibited weapon. An 18-year-old man from Coburg will be charged on summons with possessing a prohibited weapon. The other two men were released without charges. 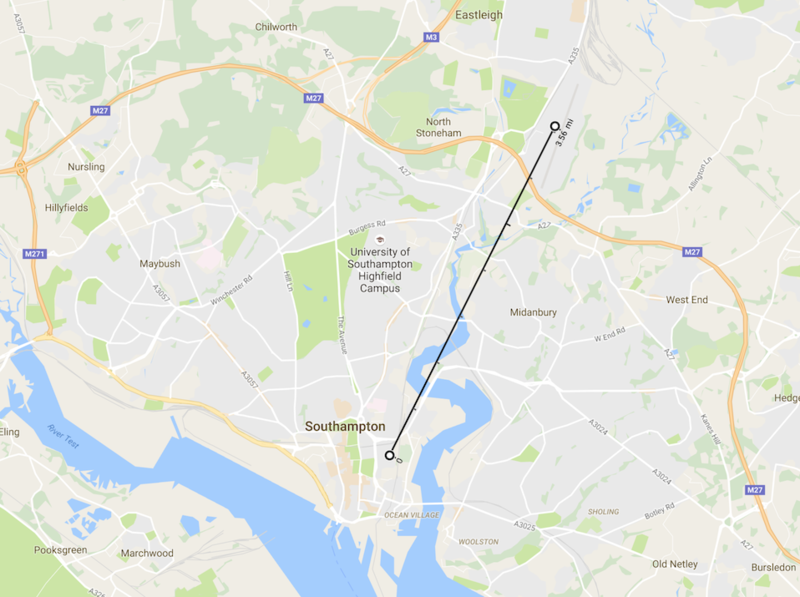 A 15-year-old boy from Sunderland (in Tyne and Wear) was arrested on August 27 2013 for aiming a laser pen at a police helicopter on Wearside. 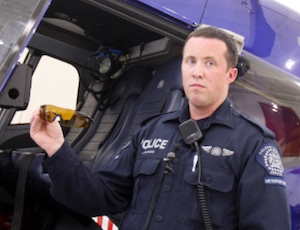 He was charged with recklessly or negligently acting in a manner to endanger an aircraft. A court date of September 19 2013 was set. 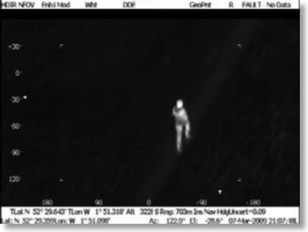 A police helicopter was searching Hebburn (in Tyne and Wear) on May 8 2013 for a missing 11-year-old boy, when the cockpit filled with green laser light. The crew was startled and the pilot changed course. The beam was traced to a home in Hebburn. In a back bedroom, ground officers found two persons on a bed, 18-year-old Victoria Rayner and her 25-year-old boyfriend Robert Gilbert. Both denied having a laser pen. After a struggle during the arrest, officers found the laser pen under the mattress. On August 27 2013, they both pleaded guilty to shining a light at an aircraft in flight so as to dazzle the pilot. Additionally, Gilbert pleaded guilty to resisting arrest. There is no prison term available for the offenses, only fines. They were fined a total of £305 (USD $473): a fine of £100 each, court costs of £85, and a victim surcharge of £20. Two males were arrested August 20 2013 for shining a laser pen at a police helicopter in Maidenhead, a town about 12 miles west-northwest of London Heathrow Airport. They were arrested on suspicion of endangering the safety of an aircraft; in addition, a laser pen was seized. A 17-year-old was bailed until September 10 while the other male arrested was released without charge. A spokesperson for Thames Valley Police said this was the first incident he had heard of in “a long time” in the area. Pilots landing at Gerald R. Ford International Airport in Grand Rapids, Michigan on August 17 2013 complained about a green laser being aimed at them from an area three miles to the east. 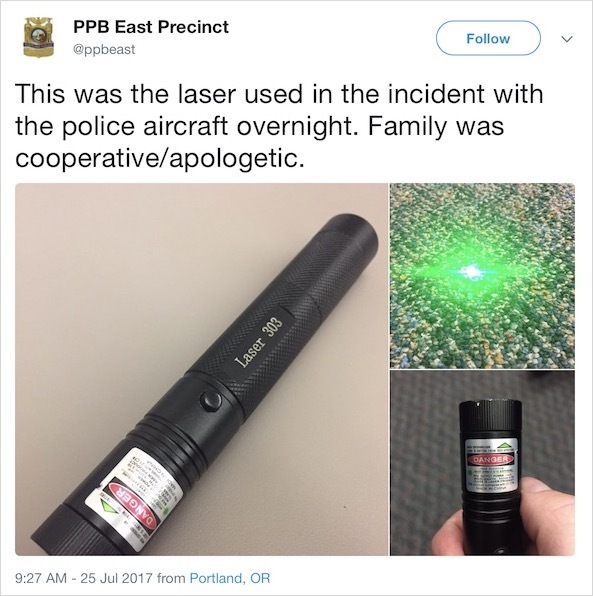 Two days later, police responded to the same area, in the city of Kentwood, after “someone reported a similar light shining in their window.” In a nearby home where an 11-year-old boy lived, police found and confiscated a “high-powered” laser. The boy denied aiming at the planes. The investigation is still open. From WWMT Newschannel 3 and MLive. A video news report is at WOODTV.com. Feliciano was charged with two counts of aggravated assault, risking a catastrophe, and "related offenses." He could also face federal charges. This comes four days after 20-year-old Luis Martinez was arrested for a similar type of police helicopter illumination. Two New Zealand men were found guilty on November 10 2012 of “causing unnecessary danger to an aircraft” in a May 2011 lasing of a police helicopter. Joshua O’Hare-Knight, 21 and James Spiers, 19, face up to 12 months in prison. Sentencing is scheduled for February 2013. A video taken from the police helicopter, showing the laser beams, is here. From the New Zealand Herald and Stuff.co.nz. Thanks to Mark Wardle of NZALPA for bringing the video to our attention. This is an updated story; the original LaserPointerSafety.com news item from May 2011 is here. An 18-year-old man was arrested in Blackburn, Lancashire, for aiming a laser pen at a police helicopter pilot. The aircraft was returning from a mission when the incident occurred. The aircrew tracked the laser and notified ground officers, who approached a group of men traveling in a car. The unnamed teenager was arrested. 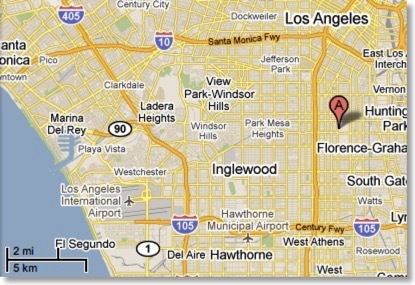 A Glendale, California police helicopter was illuminated by a red laser beam three times on April 27 2012. The beam was easily traced to two men in a home’s backyard. 18-year-old Dylan Chavez and 20-year-old Jason Phillips were arrested on suspicion of discharging a laser at an aircraft. As of April 30, they were not charged under the new federal anti-laser law signed Feb. 14 by President Obama. One day after an 18-year-old was arrested in North Hollywood for lasing a jet and a police helicopter, a 16-year-old Glendale boy was arrested for illuminating a Glendale police helicopter with a green laser. 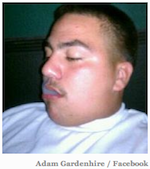 The incident happened about 10 pm on March 30 2012, near Pacific Avenue and Ventura Freeway. The helicopter crew was able to track the laser and inform ground officers. A group of men were running into a home when the police arrived. The 16-year-old told officers he was aiming at the moon when the helicopter appeared in the beam path. He was booked for discharging a laser at an aircraft. 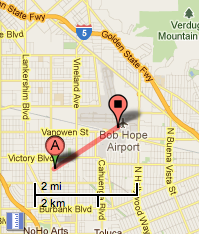 The Glendale location is 7 miles east of the day-earlier North Hollywood location. Two Jacksonville, Fl. 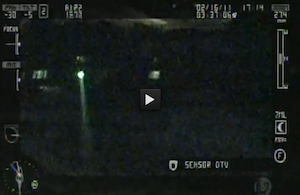 area teenagers were arrested March 22 for illuminating the cabin of a Coast Guard helicopter. The Dauphin MH65D aircraft was operating near the suburb of Orange Park when it was lit up several times by a green laser. 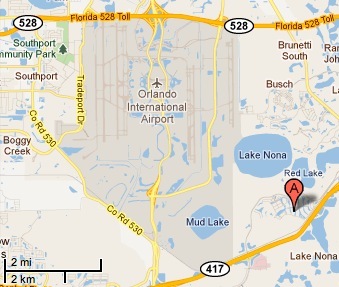 The pilots were able to determine the location of the laser, and report it to the Orange Park Sheriff’s Office. They arrested 18-year-old Devon Christopher Joyner and 16-year-old Kalib Taylor Hodge. Both were charged with misuse of a laser light on an aircraft. According to deputies, a witness had told the teens to stop lasing, because they were breaking the law. It is unknown whether this was told to them before or after they illuminated the helicopter. Three commercial aircraft were illuminated by a green laser beam while on final approach to Auckland International Airport on January 26 2012. The police helicopter Eagle was sent to investigate and was also lit by a laser. Police said that all four aircrews suffered temporary flash blindness. 18-year-old Pravikash Chandra was arrested and charged with four counts of endangering transport. Each charge has a maximum penalty of 14 years in prison. UPDATE July 18 2012: Chandra pleaded guilty to all four charges of endangering transport. Sentencing was set for September 2012. A report on the laser’s characteristics, applications, place of purchase and use instructions will be prepared for the judge. From the New Zealand Herald and the Herald Sun. A teenager from Wolverhampton was arrested for aiming a laser pen onto a West Midlands Police helicopter that was over Wolverhampton on January 8 2012. 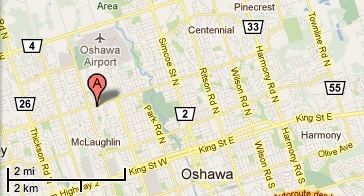 The 18-year-old was charged with recklessly acting in a manner likely to endanger an aircraft or person in an aircraft. He will appear in court on January 18. The three will be arraigned in court on January 9. There had been concern over local airspace due to a January 8 political event at Free State Stadium with over 100,000 persons in attendance. The laser incident appears to be unrelated to a temporary Notice to Airmen (NOTAM) requiring general aviation and recreation pilots to file flight plans in advance. From The New Age. According to a separate story in The New Age, this was only the second time that arrests have been made in South Africa for aiming lasers at aircraft. The first was in May 2010 during a World Cup event. A Pasadena (California) police helicopter was illuminated twice by laser light on December 28 2011 as it flew over Altadena. The pilot was able to locate the source. Ground officers identified a 15-year-old, who told them he was aiming at the helicopter. His laser pointer was confiscated. No arrest was made that evening, but police will be speaking with the parents (who were not home at the time). Misdemeanor or felony charges may be filed. If a misdemeanor, the penalty could be up to a year in jail and/or a $1000 fine. If a felony, the penalty could be from 16 to 36 months in state prison and/or a $2000 fine. Two teenagers were sentenced to four months in jail for a “stupid [and] extremely dangerous” lasing of a police helicopter over north Hull. Benjamin Ireland and Ryan Whybrow, both 19 years old, looked stunned as the judge sent them to young offenders’ institutes. The two were at a party and were drinking when they decided to point green laser pens at a police helicopter “for a laugh”. The pilot and crew were flashblinded by repeated and continued illumination. The pilot made an emergency landing. Ground units directed to the location arrested Ireland and Whybrow. New Zealand: UPDATED - Laser charges dropped because of "good character"
A New Zealand man had charges of endangering transport dropped because of his “good character” and personal circumstances. 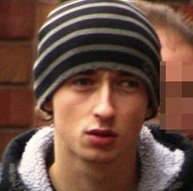 James Paul Burton had been arrested for aiming a laser pen at a police helicopter in December 2010. He was 19 at the time of his arrest. His lawyer successfully argued that a conviction put Burton’s career plans at risk, as well as his application for New Zealand residency. The judge agreed, stating that the consequences for Burton outweighed the seriousness of the charges. Charges were dropped on October 25 2011. From Auckland Now. LaserPointerSafety.com previously reported on Burton’s case on September 17 2011. A 19-year-old, whose lawyer said he had learning difficulties and was “immature,” was sentenced on October 20 2011 to six months in jail after pleading guilty to lasing a police helicopter. 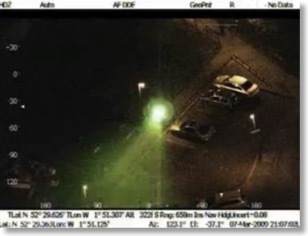 On September 11 2011, the West Midlands Air Support helicopter was sent to investigate a report of a commercial flight that had been illuminated by a green laser. The police crew was themselves dazzled by a green laser, aimed from a car on the ground. They directed ground units to the car where Wayne Junior French was sitting. He admitted shining the laser at the helicopter. Police arrested a 13-year-old boy for aiming a laser pen at a Thames Valley Police helicopter flying over Slough on October 2 2011. Slough is a borough about 22 miles west of London, in Berkshire. The teen was arrested on suspicion of endangering aircraft. He was released on bail until October 27. A police helicopter answering a 999 emergency call was diverted by a “high powered” green laser pointer as it flew near Coventry on September 28 2011. The helicopter was searching for intruders in a woman’s garden. A 16-year-old man and a 33-year-old man were arrested on suspicion of recklessly endangering an aircraft. The Cambridge News said that in 2010, there were five incidents involving lasers being aimed at the Cambridgeshire police helicopter. A 20-year-old New Zealand man who pleaded guilty to “endangering transport” by lasing an aircraft is asking for leniency because a conviction will affect his employment and travel. On September 16 2011, Burton’s lawyer told the court the act was done stupidly without thinking, after drinking with friends. She asked that Burton be discharged without conviction due to his age and future career plans. In 2007, Burton had arrived in New Zealand with his mother and sister, and all three are applying for residency. A conviction would affect his residency and his ability to find work and travel overseas. In turn, those restrictions could impact his ability to complete his studies in marine biology. New Zealand does have a seven-year “clean slate” law, but his lawyer argued that Burton needed to complete his studies, apply for residency and find work before 2018. UPDATE OCTOBER 27 2011: The judge agreed with Burton’s lawyer, that the consequences for Burton’s career and residency application outweighed the seriousness of his offense. The charges were dropped. More details are in an October 27 story in Auckland Now. 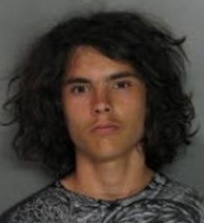 Sacramento police have put Jacob George Risch, 19, on their local “Most Wanted” list for failing to complete conditions of his probation for lasing a California Highway Patrol airplane. 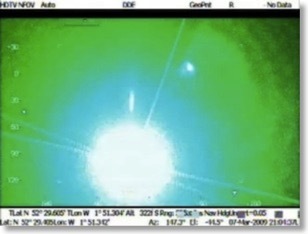 Risch and a second youth were apprehended June 20, 2010 after aiming a green laser beam at the aircraft six times. The second youth was released; Risch was arrested on suspicion of discharging a laser at an aircraft and possession of small amount of marijuana. Risch was 18 at the time of his arrest. He pleaded no contest on September 13 2010 to a felony count of discharging a laser at an aircraft. He was sentenced to 60 days on the sheriff's work project and five years probation. On November 30, his probation was revoked for failure to complete the terms of his sentence. 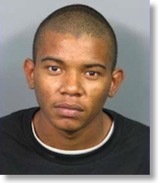 He was put on the Sacramento Police Department “Most Wanted” list on January 17 2011. From the Sacramento Bee (Risch is #9 in this “Most Wanted” slideshow), Sacramento Police Department. News of the original arrest from News10.net and Wopular.com. UPDATE September 2 2011: Apparently, Risch has not yet been apprehended. LaserPointerSafety.com has not been able to find any indication of his removal from the Most Wanted list, or news items of any capture or arrest. According to the judge, “this was an extremely serious offence which could have ended in several fatalities” to those on board and on the ground. On July 22 2011, 18-year-old David Taylor of Newcastle began a three month sentence in a young offender’s institute, for aiming a green laser pen multiple times at a Northumbria Police helicopter. The pilot was forced to change course during the March 12 2011 incident. Taylor was later convicted of recklessly acting in a manner likely to endanger an aircraft. A 12-year-old boy aimed a green laser at a Tulsa, OK police helicopter “to say hello to the pilot”, according to a police spokesperson. 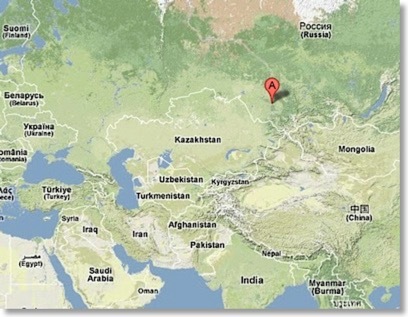 The incident happened around midnight July 10 2011. Police on the ground, alerted by the pilot, found the boy in the parking lot of the Tulsa Mosque. The incident will be reported to the FAA laser database. There is no word of any additional charges that might be brought against the boy. 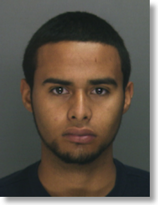 A 22-year-old Philadelphia man will be spending the next year and a half in prison, for an incident where he aimed a green laser at a city police helicopter. The pilot was temporarily blinded, felt a sudden intense pain in his eye, and “lost control”; his co-pilot took over. According to press reports, it is unclear if the man, Lenny Tavarez, knew that the laser could cause a crash. Tavarez was 19, and a recent high school graduate with no criminal record, when the October 2008 incident occurred. He was sentenced May 13 2011. From Philly.com. A report of the original 2008 incident is at ABC 6. The pilot was forced to break off their search in order to find the laser perpetrators. They landed at a nearby airfield. The two teens were arrested and may charged with recklessly acting in a manner to endanger an aircraft. The grandson of a prominent New Zealander was arrested after shining a green laser onto a police helicopter on March 25 2011. 17-year-old Joseph Mark James Corban was charged with reckless disregard for the safety of a police helicopter, which can be punished with up to 14 years in prison. The teenager’s grandfather is the late Joe Corban, MBE, a key figure in developing New Zealand winemaking. A 13-year-old was charged with reckless endangerment and “laser pointer misuse” after a Maryland State Police helicopter was tracked on April 17 2011, in eastern Baltimore County. Both pilots were temporarily blinded by the green beam. They were able to recover their night vision and train their spotlight on a home that the boy ran into. Ground units recovered a laser pointer from the home. 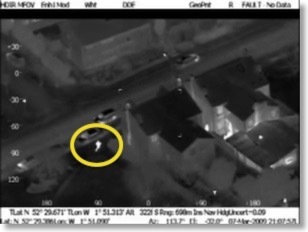 A 10-year-old illuminated a York Regional Police helicopter multiple times with a green laser pointer on Feb. 16 2011. The pilot broke off an active search and “immediately navigated the helicopter to safety” after noticing the green light. Police located the source and talked with the youth’s parents, who had been home during the incident. They were aware the boy had the pointer, but did not know the boy was tracking aircraft with it. Because the youth was under 12, he was not charged. The incident happened in Richmond Hill, Ontario (near Toronto). York police said there have been four incidents so far in 2011, and more than 12 in 2010. From the Toronto Star, National Post and YorkRegion.com. In an incident in late March 2008, six planes had to alter their flight paths into Sydney’s airport after pilots reported a “coordinated cluster attack” of “up to four” laser beams. This incident has been cited numerous times as perhaps being a dry run or test for some more sinister laser usage. Hempen said that investigation by US and Australian officials revealed that the Sydney "cluster attack" was caused by youths, riding their bicycles on a golf course at night, who stopped and took the occasion to illuminate landing aircraft. He noted that the youths’ local community had a history of acrimony directed at the airport authority due to the construction of a new runway which caused more flights over their residential area. Based on a Feb. 1, 2011 presentation to SAE G10T. Two teenagers were arrested for shining green laser light at a Collier County (Florida) sheriff’s office helicopter at about 1 am on New Year’s Day. After landing, the two pilots “realized they both had ruptured blood vessels in their left eyes” and went to a hospital for treatment. A 19-year-old man was sentenced to 15 months in U.S. federal prison, for illuminating a California Highway Patrol helicopter with a green laser beam. Nathan Ramon Wells will also be on probation for an additional three years after he completes his prison sentence. ”This was a very serious crime that deserved prison time,'' said Assistant U.S. Attorney Charles Pell. The June 3 2009 incident caused the helicopter pilots to be “momentarily blinded” and to change course -- breaking off from assisting police in a burglary investigation. The helicopter then tracked the car from which the light came. Officers on the ground stopped the vehicle and found Wells and a laser inside. During an interview with FBI agents in January 2010, "the defendant admitted that he pointed a green laser at the helicopter, which he knew was a police helicopter," according to the plea agreement, which says "he acted with reckless disregard for the safety of human life." In July 2010, Wells pled guilty to the felony of willfully interfering with an operator of an aircraft. From the Los Angeles Times; also at Gawker, Palm Springs Desert Sun and KESQ TV. Note: Sources differ on Wells’ age at sentencing; some say he was 19, others say he was 20. Sources also differ on the maximum penalty possible for interference with an operator of an aircraft; some say 3.5 years is the maximum, others say 20 years. And, sources differ on the date of the guilty plea; some say July 2010, others say September 2010. Australia: Six planes targeted in alleged "coordinated cluster attack"
Air traffic controllers had to close one flight approach late on Friday, after up to four people targeted planes with lasers in an apparently co-ordinated attack. 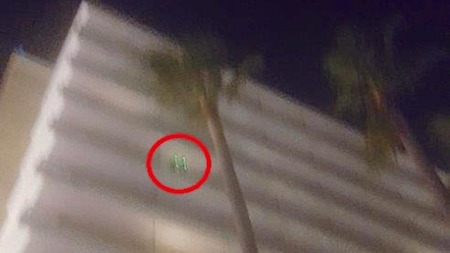 Pilots reported a number of green lasers were trained on their planes for about 15 minutes, from 10.30pm (AEDT). The lasers appeared to have originated from the Bexley area, in south-western Sydney. "This was the worst attack in our experience," Air Services Australia spokesman Bryan Nicholson has told Fairfax News. "It was described by the pilots as a cluster attack which implies some sort of co-ordination or organisation." The Civil Aviation Safety Authority (CASA) said such laser attacks on planes were increasing in frequency. "There are five to six reports every week around Australia," CASA spokesman Peter Gibson told Fairfax. "It is extremely dangerous as it can temporarily blind a pilot or distract them as they are coming in to land." NSW Police Minister David Campbell vowed to change the law to classify powerful laser beams as illegal weapons. "These gutless and cowardly attacks have to be stopped," he said. "I am preparing a proposal to cabinet to consider making these items a prohibited weapon." The maximum penalty for shining a laser at a plane is two years in jail.